David Tennant voices one of the characters in Postman Pat: The Movie. David Tennant voices Wilf, the manager of singing star Josh who is voiced by Rupert Grint. The voice cast includes Stephen Mangan as Postman Pat, as well as Jim Broadbent and Rupert Grint. Ronan Keating will be the singing voice of Postman Pat. The movie was released in 3D on 23rd May 2014 in the UK and Ireland. The London premiere of the movie was on Sunday 11th May and the soundtrack was released on Monday 26th May. For posts related to Postman Pat: The Movie on Blogger.com click here. 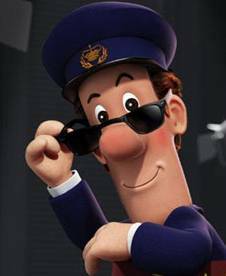 Postman Pat: The Movie will be released on DVD and Blu-ray in the UK on Monday 29th September. Postman Pat: The Movie has taken almost £3 million at the UK box office. Postman Pat: The Movie is available to pre-order on DVD and Blu-ray. The release date has not been announced yet. The London premiere of Postman Pat: The Movie is set for Sunday 11th May. Radio Times has a competition to win tickets to the premiere.